Not all of the reference interactions I post here have a moral, but this one does - and it's one of my favorite morals. On Fridays, my library closes at 5:30pm. At about 5:25 one Friday, an older gentleman comes down the stairs to the reference area, where most of our public computers are. Now, any patron coming in right at closing time is always a bit worrysome - but moreso when they, like this patron, come right up to the desk and say they need to print something. Printing at the last minute is always fraught with potential calamity. However, thankfully, all this patron needed to do was to print a boarding pass attached to an email - we opened it, printed it, and everything went smoothly so we were still finished before 5:30. Nice. I'm the guy that donated all these computers [motioning to the workstations]. That's me [pointing to the wall plaque below]. I need help using them, but I know they're important. We had a bit of a laugh over that, then he thanked me for helping him, and I thanked him for his generous donation, and walked him out. Hopefully, the moral is clear: when you work at a public library, it's important to provide good customer service for every patron interaction, because every patron is a voter and you never know what other connection to the library they may have - even five minutes before closing time. And more importantly, thank you to everyone who supports their local library! When I came in on Tuesday this week, I found a note with a patron's name and number, and the message, "donate wood." I thought that seemed interesting, so I asked my coworker (based on the handwriting) what that was all about. She explained that this patron had called the night before, saying that he had a bunch of nice boards in his workshop that he wasn't going to use, and asked if we knew of anywhere that would accept them as a donation. This is actually a fairly straight-forward question, as people ask us things like this (for items other than wood) every so often. But for some reason, this question just felt different. Anyway, my coworker said that she had suggested the local vocational schools to him, but he wasn't interested in those - but without explanation. So it's possible that this question felt odd because it wasn't so much about place to donate to as much as finding someone willing to come clean out this patron's basement. We didn't know that, and I did have a few other ideas for possible donation ideas, so I called the patron back. He turned out to be a very nice older gentleman, who did woodworking as a hobby and prided himself on using only quality material. The wood he had was various sizes of oak, poplar, and even some mahogany. At first we talked about the quantity and condition of it, so I could gauge whether it would make more sense for a group like the Chelmsford Open Space Stewards, who do lots of outdoor work, or something like Lowell Makes, our local community makerspace. Or, if he didn't mind, the library could hang on to it and use it as necessary. It turned out that although it was nice wood, he didn't actually have a huge amount to donate - maybe eight boards (as opposed to the piles and piles I initially pictured for some reason). And when I took down his address, I realized he lived a half a block from somewhere I was going to be that evening for a meeting anyway. So, I told him I could be by that night to pick it up. When I got there he had it ready to go in his garage, and loading into my car only took a few minutes. I must have been asking the right kind of questions, because he started telling me about some of his previous projects, and even offered to show me his workshop. Clearly he was proud of his hobby, and I can't blame him for that. However, since I was on my way to another meeting, I just thanked him for the donation and headed off. In the past, I (and other library staff and volunteers) have done home pickups for items being donated to the library, but it's not something we ever do otherwise. In this case, if it's not stuff the library can use after all, I can always call around later to find someone who can. But it was definitely worth the trip, and the patron really appreciated it too. I am pleased to be able to present the Chelmsford Public Library with a copy of the recently-published Census Atlas of the United States, a volume which I cooauthered with several colleagues at the Census Bureau here in Washington, DC. ...I wanted to personally send a copy to the Chelmsford Public Library as a way of expressing my profound gratitude to the library for the role it played in helping me discover my career as a demographer. I grew up in Chelmsford...and as a kid spent many rainy Sunday afternoons at the Adams Library. When an elementary school research project required me to incorporate census data, I found myself in the top floor of the old library, poring through Census volumes with the assistance of the reference librarian. 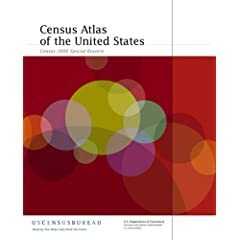 I didn't know it at the time, but those afternoons looking through old census volumes were my introduction to population statistics and to the Census Bureau, and a preview of what is now a rewarding and enjoyable career as a demographer and statistician for the federal government. ...Who knows - maybe [this donated volume] will inspire a future career path for some youngster spending quality in the library on a rainy Sunday afternoon. Not only is this a wonderful story, and a nice sentiment, but the atlas itself is pretty incredible. It is large, 12-1/4" x 15-1/4" - and almost every page is a glossy, full-color map of a particular population breakdown. Definitely a nice addition to our reference collection, and probably one that I wouldn't have purchased. So, the moral of the story is, once again, a patron's library experience is critical to the health and longevity of a library.